Transform your bedding into a valley of red blooms and turn it into a heaven of love. Make your occasions more lovely and aromatic with bloomy fragrance. 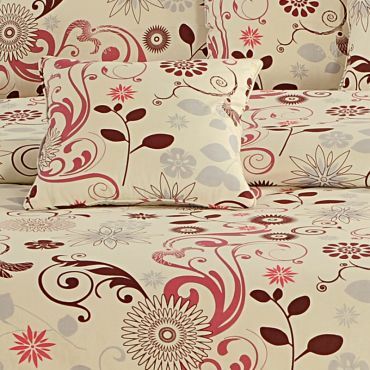 These decor bed sheets are a perfect of elegance and aroma with the incorporation of red blooms. Let The Lotus Aroma Spread Its Magic Get set ready to form the bedding comprised of multiple lotus flowers with some designing work. A layer of aroma and elegance is all set to spread its allure in the living space. Get easy way to complete your bedrooms with an ambiance of aroma and an essence of true beauty. Have A Sound Sleep in The Lap of Nature? Now, it’s been easy to rest and sleep in the lap of nature even within the premises of your own home. Feel the rejuvenating vibes and create an ambiance of relief & relax. Rejuvenating The Ambiance Through Refreshing Blooms Change the atmosphere of living area with rejuvenating vibes of refreshing blooms. Feel the paramount of freshness to heal your mind, body & soul with a soothing touch of refreshing blooms bedding set. Let Sun Reflect Its Light Through Blooms Bring home sunshine blooms bedding set and spread a contrast beauty. Let the bloomy aroma scattering in the space and fill it with aromatic vibes. The combination and yellow and purple color gives distinct look to the bedding. Spread More Than a Sheet Royalty comes with royal home products and we have designed such combination of color and pattern which sets a perfect instance of royal home fashion. Golden color merged with paisley design births unparalleled creation in face of royal paisley. These decor bed sheets are adequate for any occasion. 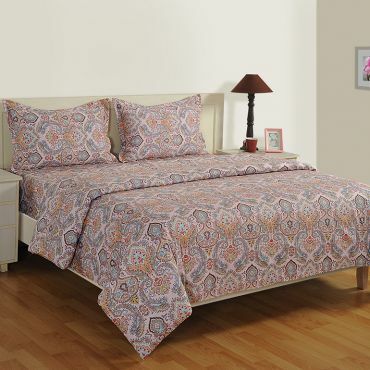 Adorning Bedding with the Supreme Beauty of Ethnic Artwork A piece of perfection is created to serve home space with elegance and luxury through charming paisley bedding set comprised of one bed sheet and two pillow covers. Adorn bedroom with best of bedding set through these decor bed sheets which are a reflection of true king of bedding. Bring Home Chilling Vibes to Beat the Summer We have introduced one of the easy ways to beat the summer this season with our frosty motifs. The combination of aqua blue color with pure cotton is purposely brought to infuse the chilling vibes into the bedrooms. Mercerized Cotton Bed Sheet: Spread A Layer of Attraction On Your Bedding Take a charming spread to your home for transforming your bedroom into a center of attraction. The combination of lovely pink with mesmerizing motifs creates that is perfectly called by the name charming motifs. 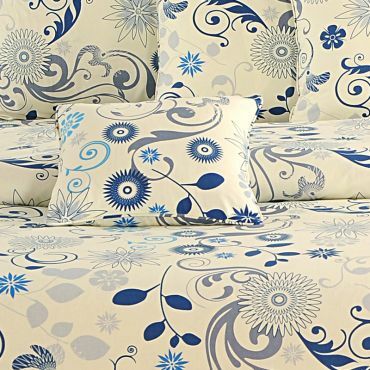 The decor bed sheets manufactures with this beauty are adequate enough to magnetize viewers. An Invitation to Love and Tender Forming an ambiance of love and tender in the bedroom,these decor bed sheets along with two pillow covers invite your beloved with affection. Spread the aroma of charm and romance into the space for making perfect harmony in your dream bedroom. 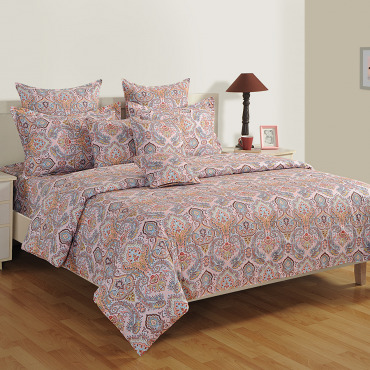 Spread The Majesty of Royal Ethnic Imprint the true of royal motifs on your bedding through ethnic bedding set. Spread a sheet with two pillow o give complete royal ethnic look the bedroom. If the other interior is ethnic, it may get gelled with that easily and birth something exceptional. 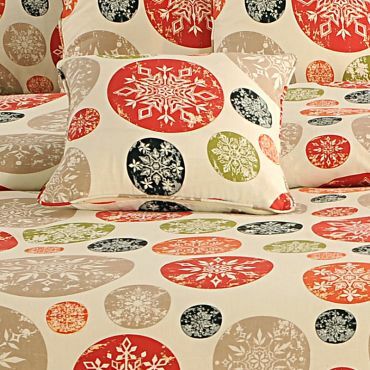 Adorn Attractive Circles of Mesmerizing Artwork The beauty of the ornaments is waiting for adorning your bedding. Various kinds of designs and patterns imprinted into circles make ornamental circles and impart the bed set from other ordinary ones. These decor bed sheets may easily attract your guests and relative with the charm of its designing work. Decorate not just ordinary, adorn motifs’ charm A blend of ornamental charm and the quality fabric is introduced in the face of this decor bed sheets which is also called by 200 thread count bed sheets because of its built which is done through intricate 200 thread count weaves. A supreme sheen and lustrous texture emerge out through this weaving process. A Spread of Elegance and Brilliance We are having a big basket of bed sets and bed sheets comprised of multiple attributes and features. Enriched with high quality and wide variety, this ananda collection brings you brilliant charm bed sheet that is wealthy of style, comfort, and luxury. 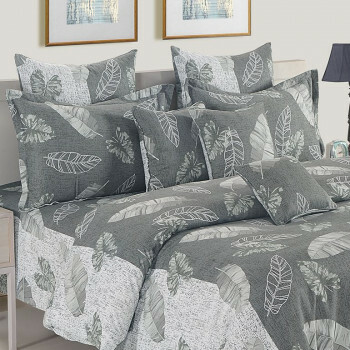 A Grace Is Waiting to Beautify Bedding Incorporation of mesmerizing designing artwork with premium fabric is brought to beautify bedding with the royal touch. 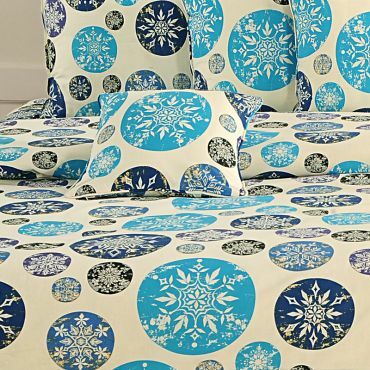 These decor bed sheets are designed intricately by mixing up various ornaments together to create the phenomenon. Brilliance of Artwork Checked Beautifully The mesmerizing artwork is waiting to beautify bedding with it intricate designing work. Incorporation of various designs and patterns on the checks emerges different kind of allure to the bedding. It magnetizes viewers with its unparalleled beauty. 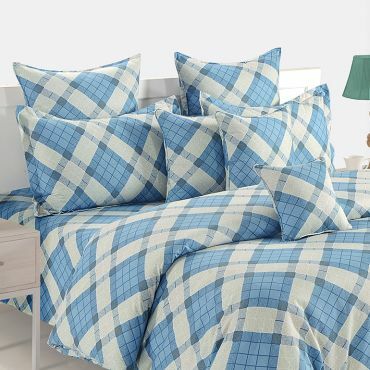 Swayam brings you a bed Set collection especially made for every occasion. It is designed to mesmerize viewers and gives pleasure to the eyes. It gets its name with its character to please the viewers and is called by the name ‘Ananda’. Adorning such appealing bed set fills the vibes of luxury and pleasure into bedrooms. The embellishment with Ananda bed set invites the cheering vibes forever in the living space. 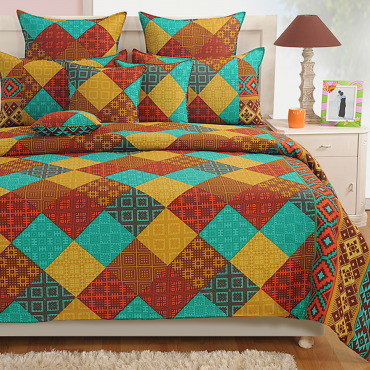 Comfort, style, and fashion are merged together to create Ananda bed set. You may get such bedspreads online in India from the house of Swayam India. 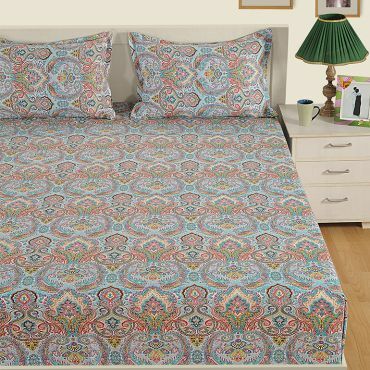 These decor bed sheets would bring home a perfect harmony of colors and designs. Using pure mercerized cotton into its manufacturing, Swayam lets its customers meet to real treasure of pleasure and happiness. We offer you one of the most colorfast bed sheets through the process of mercerizing the cotton. The colors incorporated on the products of this collection stay last forever with its actual state. The colors are denser and deeper on the products, which keep the product brighter. Apart from colorfast, we infuse strength, smoothness, resistance to mildew, and reduction of lint through the process of mercerization. We have designed such a unique mercerized cotton bed sheet which comes as more than value for money. There are also other features of this eye-catching bed set. Incorporation of 200 to 240 thread count work renders its users with ultimate shiny texture and glossy look. We have not manufactured only bed set but also found true luxury for regal living that would match with your lifestyle. The building with cotton opens the door of utmost comfort where the user may feel like heaven and easily gets a perfect sound sleep. The combination of colors and various designs would surely fetch the attention of the viewers. You may also impress your relatives and guests through such 200 thread count bed sheets blended modern charming designs of different patterns. We believe in satisfying clients with our strong listening to their brief and requirement. Our aim is to bring the smile on their faces through our customization service. We ensure them to make their house as their dream home.